This route isn't dramatic by any means, but would appeal to those who seek wild, remote country, and a bit of a challenge of course. If running, forget about it until Summer/Autumn. I've read that in Winter it is a much more serious undertaking as the 880m pass is likely to be deep under snow. 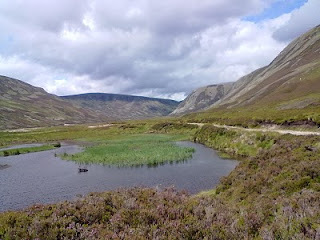 Even in Summer, there isn't much evidence left that this once served as the main route North to Inverness! The route crosses high featureless (and somewhat pathless) moorland which I'd imagine is probably more often in cloud than not, so navigation skills essential. Forecast was for the low cloud to gradually clear during the day, and a freshening N wind - perfect. I drove up to Blair Atholl station, bought some supplies at the wee shop then sat in the sun waiting for the train, really excited about the day ahead. Disembarked the train at Kingussie and started running immediately E away from town and past the Ruthven Barracks along a road. The road was quiet, but it was still nice to escape the tarmac via a gate on the right, heading off on a track through the heather towards Glen Tromie. Once around the corner and down into Glen Tromie, my route rejoined a narrow road, no traffic, providing me with a fast route into remote country. 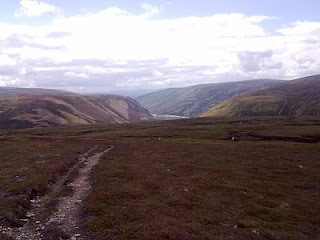 After 9 miles the tarmac finishes and on top of a steep rise I stopped to look South straight down into Gaick Pass. Scenically this looks more impressive than Minigaig due to its gouged-out features, and would be a great option for a cyclist. 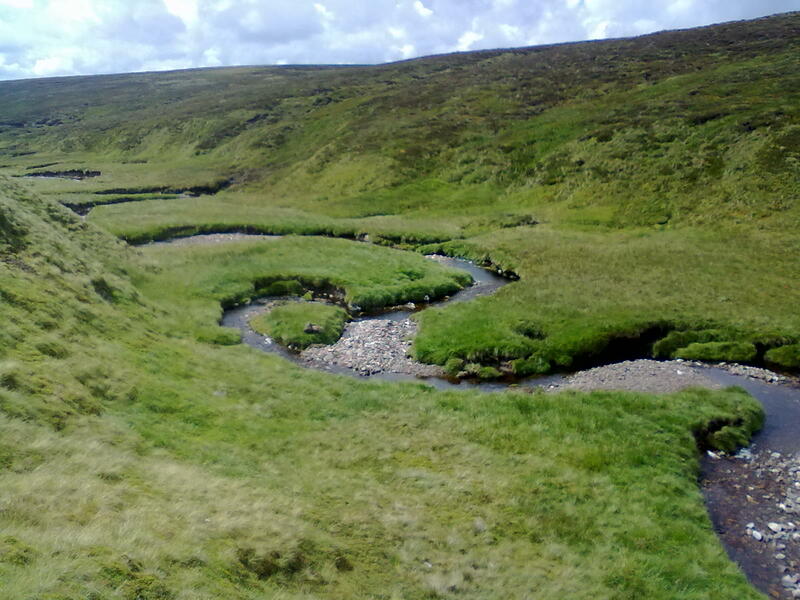 But today I wanted a wilder route, and got it a bit more than I expected at first - the gravel road finished at a weir and I was either bashing through heather along rabbit-runs or squelching in the marshy river-course. 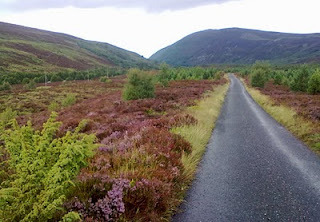 After a few minutes I got fed up and clambered up the steep bank, clawing at the heather until onto the flatter ground above, and was delighted to find myself on a bit of a trail. 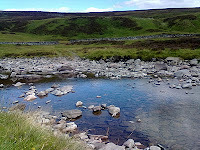 I soon lost the trail and ended up back down by the river, making very slow progress jumping burns, one eye on the Garmin navigation screen which had me heading up the Minigaig direction before I realised it. Although not particularly steep, it was quite hard work, especially at first. Eventually I did get onto what resembled an old drove road, but it kept disappearing into bog and not re-appearing on the other side. I was quite happy though, I took a couple of breaks to really enjoy where I was, there was a nice feeling of wilderness here. Cloud was scudding the hillsides a little above me. Higher up the route becomes more obvious for a mile or so. It was a nice moment to reach the summit and see blue sky appearing around. 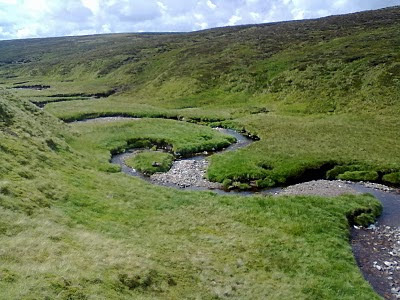 Although the route disintegrates once again, there are tiny quartz cairns marking the way down to an idyllic high camping spot (see heading picture). From there the trail improves significantly, and is an enjoyable undulating run for a few miles before descending steeply into Glen Bruar. I've walked the estate road down Glen Bruar in the past and found it a bit of a drag, but it does make for very fast, enjoyable running. 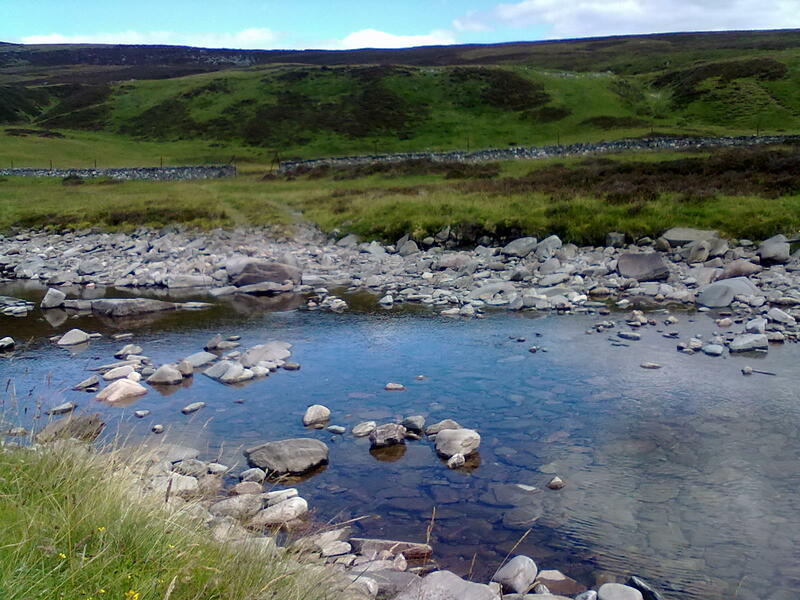 When I got down to the ford with only 5 miles to go I stopped and had a wee chill-out. What a great place to be on a warm sunny day. After hammering down the glen my legs were a bit slow to get moving again, uphill at first as the way takes a more direct line for Blair Atholl. The reward is a fun final few miles down into the trees above Blair, past the castle, and back to the station.